A shaggy, surprisingly dramatic romantic comedy, The Big Sick does exactly what I wanted from last week’s Rough Night: it isn’t afraid to steer into pathos and have people behave and react like real people. Maybe that’s because it’s based on a true story, written by the couple it’s about and even starring one of them. 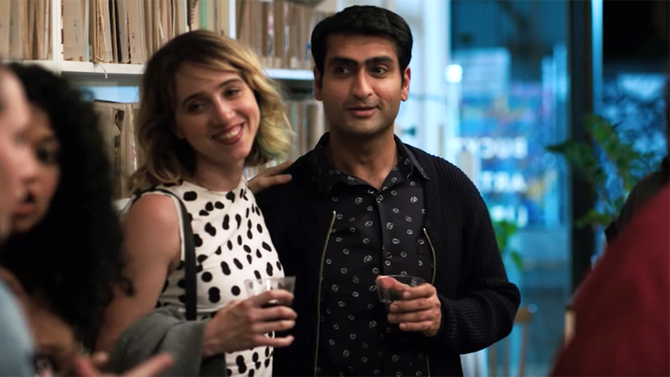 That’s not to say it’s a perfect film, but given the fallow state of comedy these days, romantic or otherwise, The Big Sick is a welcome addition to the board at the local multiplex. Kumail (Kumail Nanjiani) is a Chicagoan from a Pakistani family who moonlights as a stand-up comic. One night he meets student Emily (Zoe Kazan) and a clumsy romance begins, which he hides from his parents (Anupam Kher and Zenobia Shroff) who expect him to accept an arranged marriage with a woman from his own culture. When, finally, Kumail owns up to his family’s expectations, it ends the relationship, but then Emily has a health crisis, and the film steers into new territory. 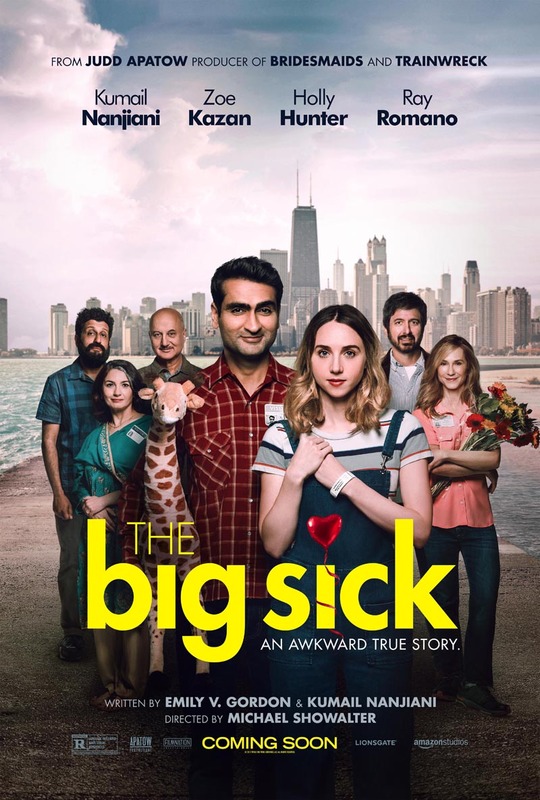 Kumail realizes his true feelings for Emily while spending a lot of time at the hospital with her bickering parents (Holly Hunter and Ray Romano). The Big Sick sinks and swims on its incidental, character-driven humour. It explores the cultural divisions between a Muslim family and the secular world their youngest son is growing up in—that’s where the script is at its bravest and funniest—with added props to Kumail’s comedy buddies, Aidy Bryant, Kurt Braunohler, and Bo Burnham. It’s also not afraid to paint Kumail as, at times, a not terribly sympathetic protagonist, though he grows in our affections when he connects with Emily’s folks—Hunter and Romano are particularly good. 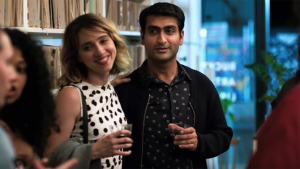 I’d bet more of the running time is spent exploring that relationship—the elder couple managing the stress of their daughter’s serious illness as well as Kumail’s presence—than the initial romance, which gives the film an interestingly unbalanced structure. The Big Sick also offers the best 9/11 joke I’ve heard in, well, ever. Yes, that’s where we are, folks. But I also felt at times like the laughs aren’t as hearty as the picture wants them to be. The script suffers for some shag and could easily have lost 20 minutes of running time, and the finale, when it does arrive, doesn’t quite deliver all the feels. 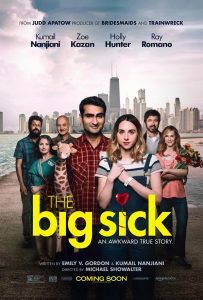 Despite this, The Big Sick is still worthwhile, solid summer counter-programming with a reasonably simple formula: Offer a measure of awkward and heartfelt observational humour in the story of real people, and modern cultures, colliding unexpectedly. Next PostNew episode of LENS ME YOUR EARS is up!